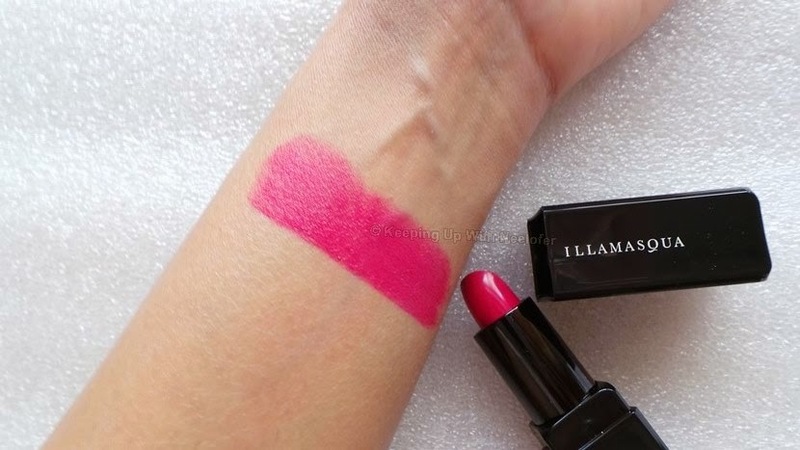 Let me start off by saying that I am sold on Illamasqua. I usually would shy away from the brand because it appeared to be too Halloween-ish. I always associated Illamasqua with dark colored makeup- the blacks, the crimsons, the greys. I Instagramed an Illamasqua look that I instantly loved; notice the eye shadow shades, though? This was then. My perspective on the brand changed completely when I was introduced to the Spring 2014 collection entitled Glamore. I was pleasantly surprised. The collection features 3 gorgeous lipsticks, 1 eye brow shade and 3 brilliant nail polish shades. I grabbed 3 of my favorites and here's what I think. Let's start with my uber favorite- the lipstick! The Satin Finish Glamore lipstick in Glissade is an intense pink. Creamy, full of shine and glides on easily- did I mention how pigmented this is? Post a meal, the color fades to a decent deep pink stain. I also created a matte finish with this lip color using a matching blush (known as Tweak from Illamasqua). Overall, gorgeous color. Love it! The Satin Finish Glamore lipsticks are available in 2 more shades: Luster (a candy pink) and Soaked (a vivid coral). Next are my second favorites- the nail polishes. Yes, I am a polish addict and when it comes to glitter polishes, the 5 year old in me comes alive. The Shattered Star Nail Varnish in Trilliant and Fire Rose (gotta love the names!) are shimmering shades that light up the nails. Both are glitter based polishes but aren't your standard glitter finishes. There are several polishes that have sparse glitter in them and are usually good as a top coat to a solid color. 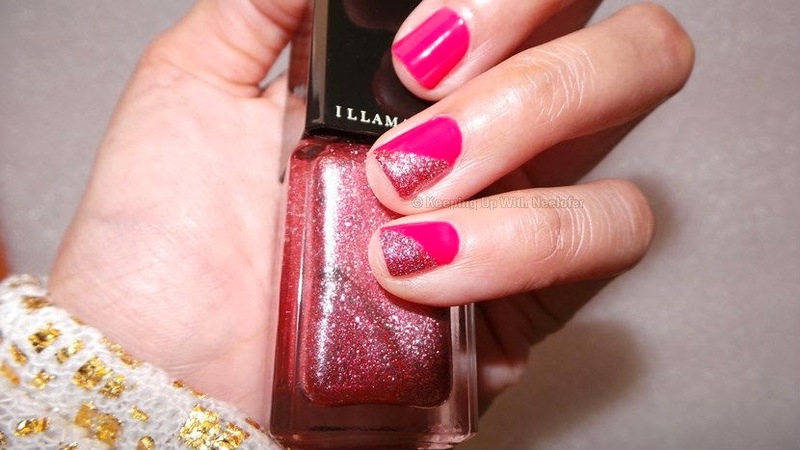 Trilliant and Fire Rose are the complete opposite- they are opaque glitter shades. Trilliant is a beautiful champagne shade. I adore it! Fire Rose is a pretty pink. This is my (unsuccessful) attempt at nail art but hey! You get to see how pretty Fire Rose is. Team up Fire Rose and Glissade for a pop of pink! The polishes are available in 3 shades including Marquise, a vibrant orange. I love this collection. 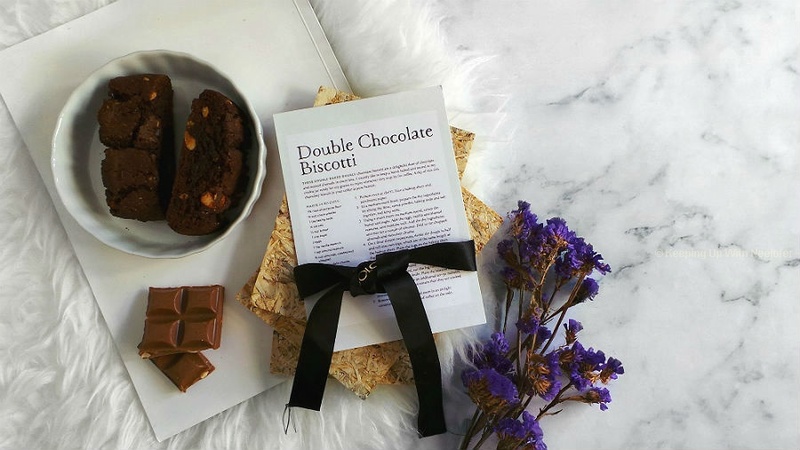 Usually, when any brand launches a new range of products, I'll either love two products from it or not like any. 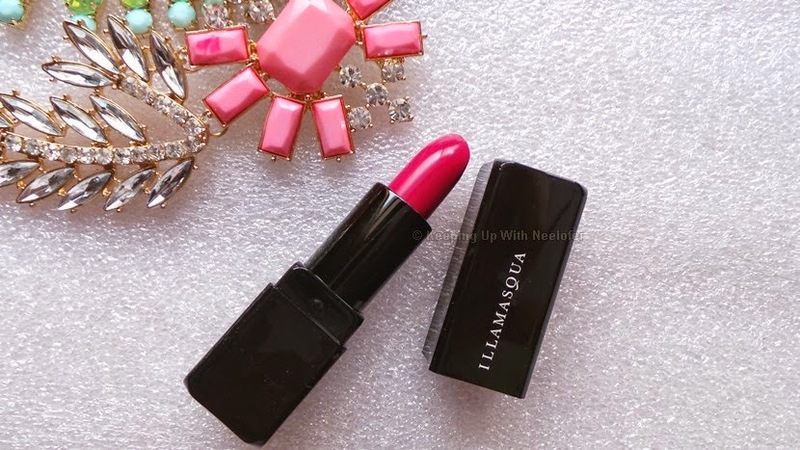 Illamasqua's Glamore doesn't disappoint! Do you have an Illamasqua product you absolutely love? Tell me about it, I might go try it! The Glamore collection is available across Illamasqua stores in the UAE.